I searched the web for the tallest man ever recorded and I found what I was looking for. I even found many mysteries about giants that has lived or walked on Earth. My search even led me to extraterrestrial beings, weird. Anyways, the tallest man ever recorded was from Alton, Illinois. He is said to be the tallest man of the world ever recorded. The name was Robert Wadlow. He was acknowledged by the Guinness World Records as the tallest person in recorded history. 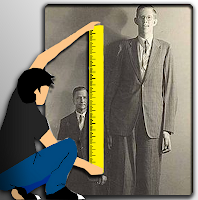 Wadlow reached 8 ft 11 in, that would be 2.27 m, by the time he died at age 22. He lived from February 22, 1918 to July 15, 1940. Man I think he could have grown taller if he didn't die. He was very tall that he even had his own customized chair when he went to school.Robert Wadlow was said to grow abnormally after an operation, it was said that maybe the operation affected his pituitary gland and it reacted abnormally by producing excessive growth hormones.